The notion of bodies having knowledge changes our society’s understanding of knowledge. At the interface of self and other, the body gains knowledge through experience. This knowledge not only determines our everyday life, but can also be made fruitful in dance. “How can I”, asks Meg Stuart in a text on her biographically motivated solo Hunter of 2014, “digest the many influences and traces that shaped me as a person and artist? How can my body unfold quantum genealogies and unrealised histories?" This quotation suggests that the body has its own historical dimension because, like an archive, it is populated with personal and cultural histories. The body conceals knowledge which, under certain circumstances, is revealed in dance. This is certainly not factual knowledge which can be passed on and made discursively accessible in symbol systems such as language. What we are talking about here is rather knowledge gained through experience. While it often remains vague and amorphous, it should still be regarded as knowledge. After all, we have no problems in tapping it in everyday situations without noticing it. Strictly speaking, however, it is misleading to speak of bodies having knowledge. According to neuroscientific research findings, what is regarded as the body’s knowledge cannot be found in parts of the body, but is transmitted to the brain or the spinal cord via nerve paths. Thus, the body’s memory, too, is an activity of the brain, not of the muscles. As French sociologist Marcel Mauss observed in his essay Techniques of the Body, the way in which people sit, give birth, swim or eat depends radically on how a certain culture transmits these skills. Every culture teaches what may be called techniques of the body. Our body and its movements are influenced, shaped and produced in a culturally specific way. That particularly applies to dancers’ bodies. It does not matter whether dancers train in classical ballet, whether they have devoted themselves to contact improvisation, or study the improvisation methods of one such as William Forsythe – they always lay down certain memory traces in their bodies which in turn influence the body and visibly shape their postures. They can recall these memory traces in a situation as an implicit movement memory, using it to deal with new situations. Thus, every dance technique is both a retrievable memory of the body, a kind of memory store, as well as access to that memory, an activity. What that also means is that how to behave in space and time and vis-à-vis other dancers within that space is also a certain knowledge of the dancing body. The body is an updated historical formation into which one dances in order to trace the pattern of one’s cultural and personal histories and the emotions associated with them. If when it is updated, the body’s knowledge coincides with the update, however, it changes every time it is retrieved. It is not archived like a document that can be retrieved later in the identical form at different times. The body is subject to time and thus to the change that creates every remembered movement in ever new ways. Another dimension of the body’s knowledge emerges from Meg Stuart’s aforementioned statement, one that may be more unsettling than that knowledge of movement is acquired. How can Meg Stuart’s body unfold genealogies, and thus present knowledge of experiences that could not be accessible to her personally? Following empirical research on the contexts in which infants tense their muscles, French philosopher and dance researcher Michel Bernard emphasises “muscular dialogue”. Muscular tension is not only necessary to perform a certain movement, but is also always an expression of emotions. Laughing or crying requires a certain tension of the muscles, which is felt to be pleasant or unpleasant, thus laying emotional paths in the body. Thus, maintaining a certain muscular tension may trigger an emotional memory. The body is associated with emotions. Our image of the body varies according to the bod’s libidinous associations which are distributed around the body. But that is not all. Muscle tone is always also an impression of the other that makes me laugh or cry. Experiences of the other become parts of me through my reaction to them. In this connection, psychologist Thomas Fuchs speaks of an implicit memory that influences a child’s future relationship patterns. On the one hand, being in the world holds the promise that a human being can act creatively to define himself with the future in mind. Knowledge is thus always something that is produced in practice. Activating the body’s memory, therefore, always also means that new experiences are possible. On the other hand, however, the implicit memory of each individual sets limits to this modifiability. If the body’s memory always consists primarily of the memories of other bodies and their experiences, then war, losses or other traumatic experiences are also present in the bodies of people who have not had such experience themselves. The body knows without ‘knowing’. In this connection, one could speak of a non-simultaneity of the simultaneous, since emotional physical knowledge will always defy progressive thinking. A layer of deceleration forms which cannot be integrated without some kind of remembrance work. Because of its physical basis, one’s own culture consists of heterogeneous layers, into which the body introduces other spaces through its memory, thus allowing intermediate spaces to be created, exploring which is the task of art. 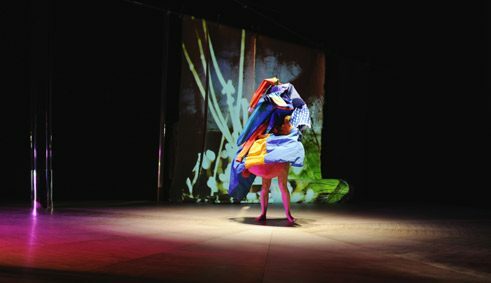 Perhaps, as in Meg Stuart’s Hunter, dance is a special form of movement and an art of deceleration that can explore those intermediate spaces between the self and the other, the personal and the cultural, the contemporary and the historical, and can bring their different forms of knowledge into play.